A thoracostomy tube is indicated in patients with a pneumothorax, hemothorax, or pleural effusion. Small, asymptomatic pneumothoraces or hemothoraces do not need drainage. However, liberal thoracostomy tube placement should be considered in small pneumothoraces in patients on mechanical ventilation or for planned air transportation, because of the risk of tension pneumothorax. 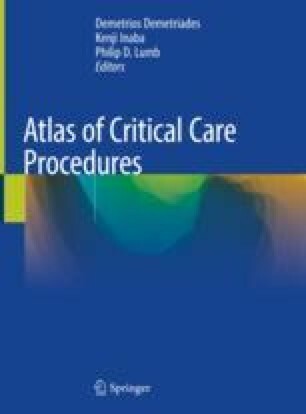 Strict aseptic techniques (mask, sterile gloves, gown, and, drapes) should be followed throughout a thoracostomy tube insertion, to reduce the risk of empyema. A single dose of cefazolin should be given prior to the tube insertion. There is no need for longer antibiotic prophylaxis. Thoracostomy tubes may be inserted either via an open technique or a percutaneous insertion. Small-size tubes (28–32 in adults, refer to Broselow tape for children) are as effective as larger tubes in draining hemothoraces. The chest tube should be removed as soon as possible to reduce the risk of empyema.